The antique look of this tabletop clock is enhanced by its bent scroll design and aged finishes. 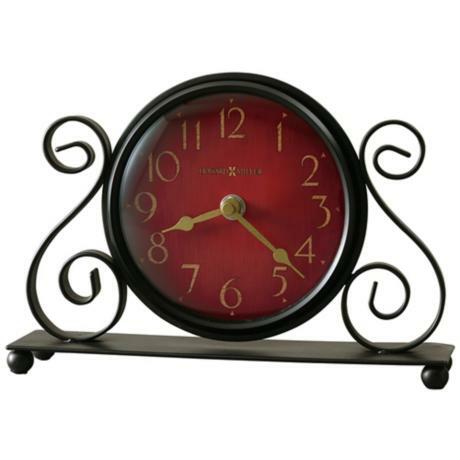 This bent-scroll iron table clock features a metal base and round ball style feet in charcoal black. The dial offers an Antique Red background with a charcoal red bezel surrounding it. Aged gold numbers and hands adorn the dial, which sits beneath a convex glass crystal. • Gold, green, rose, and white finish. • Detailed with jewels and faux pearls.